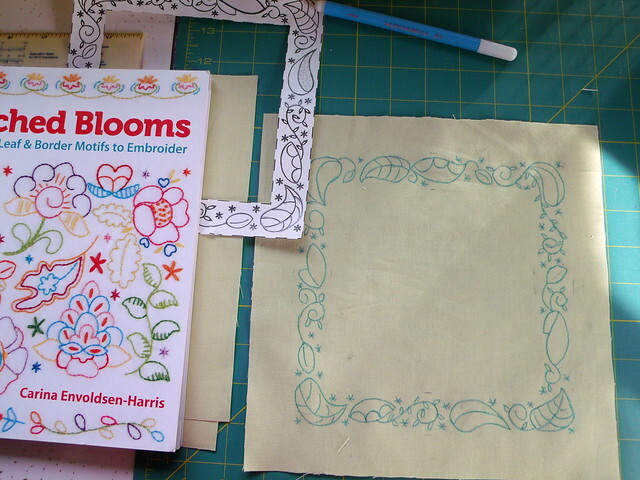 One of the projects that I was absolutely dying to get started on when I got the cast off is the calendar project from Stitched Blooms by Carina Envoldsen-Harris, which is a fantastic book. I wrote a review here on Amazon where you can see all the details about why this book made little cartoon hearts pop up over my head the whole time I was reading it. Yesterday I cut fabric and transferred the design, then spent some time after dinner going through my embroidery floss and picking out colors. This is going to be so much fun to work on! You can see a photo of what the calendar looks like here, about halfway down the page. Isn’t that pretty? Oh, and the counter in the photo? That’s one of the changes I’ve made to my sewing room/office. There used to be a futon in there taking up maybe a third of the space in the room. It was crowded and didn’t have enough storage space, so everything was always a total mess. I also work from home, so I spend my entire workweek in there, which doesn’t help with the mess factor, and working in such a messy room felt claustrophobic at times. Another problem was the fact that my only work surface was my desk. To to any sewing or cutting, I’d clear all my work stuff off the desk the desk and move the computer and monitor down to the end. 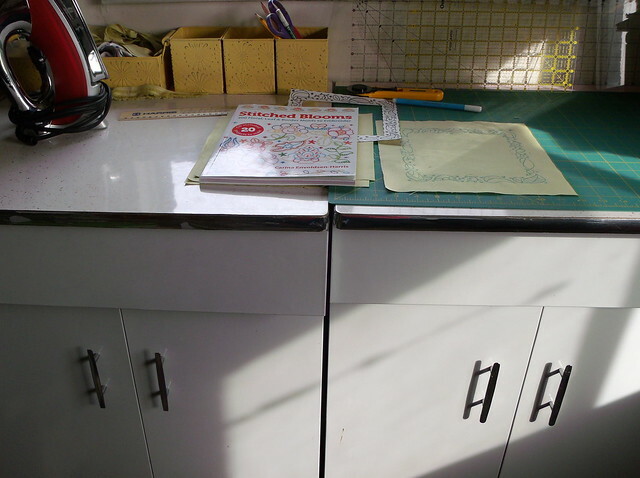 If I was cutting fabric or transferring an embroidery design, I’d end up all hunched over the desk. If I needed to alternate between cutting and sewing, I ended up moving the sewing machine back and forth to make room for cutting. Moving the futon out of there made the room look huge. I have a bunch of new storage acquired from Craigslist and auctions, including these two cabinets, which are an infinitely better work surface for cutting, etc. Eventually I’ll probably paint them — and recently I saw this fantastic paint you can use to refinish Formica, which is intriguing. I wouldn’t want to use it if it’ll make the surface less smooth, so I definitely need to read up on it first, but it’d be lovely if I could make the tops of the cabinets a prettier color. There’s also a shelving unit going in there as soon as it’s done being painted. It was in pretty rough shape when it came home. I put a coat of gray primer on it over the weekend, then a coat of very red paint the other night, and Don’s been painting the shelves (which slide out — there are a ton of grooves so the shelves are all movable). It’s going to need one more coat, and then it should be ready to go upstairs. I’m so excited to have all this storage space now! I’ve been slowly moving things around and organizing. I think there might even end up being enough room that I won’t have to store all my yarn in the closet anymore. (About a third of my clothes closet space is devoted to storing three bins of yarn, which, um. That’s totally something that normal and reasonable people do, right?) I have some before photos, which I might post with the after photos once it’s all done… but I don’t know. They’re pretty embarrassing stuff. Getting close to finished! Currently working on the section that looks like a parquet floor. I also need to go back to the section before it and finish up — I forgot a bit on the outside edge. 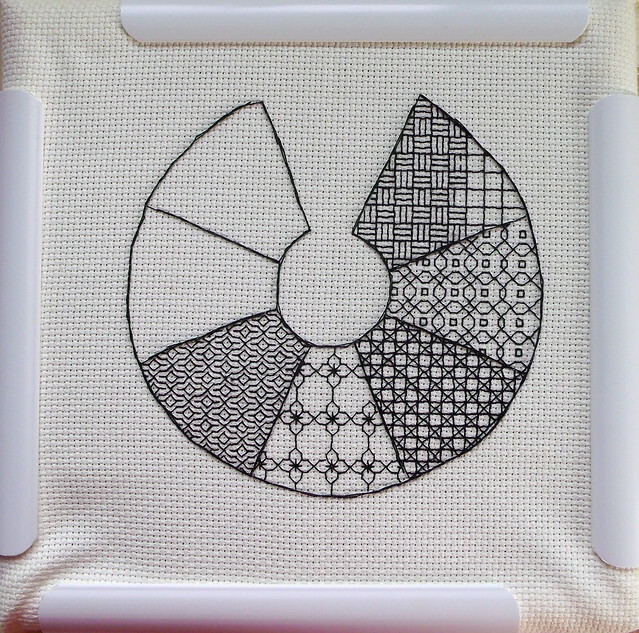 In the comments to this post, Kim from String-or-Nothing (whose Ensamplario Atlantio I’ve been getting these blackwork filling patterns from) left some good advice about leaving the outline for last to make the stitching easier, which I’m definitely going to try next time.